It seems silly to post a tuna fish sandwich recipe, especially a recipe during which one simply dumps the tuna fish directly on the bread, so I should tell you right now that this recipe is about technique. 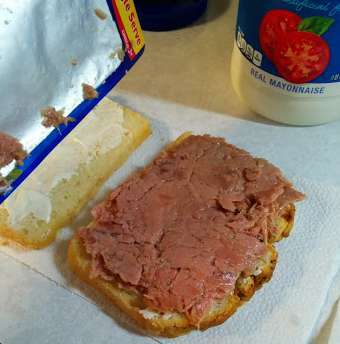 This sandwich requires three ingredients: 2.5 ounces of tuna fish, mayonnaise, and 2 slices of Sourdough Milk Bread. Servings: One sandwich equals either one big serving or two small servings if the sandwich is cut in half after preparing. Brown two slices of sourdough milk bread in a toaster or toaster oven. 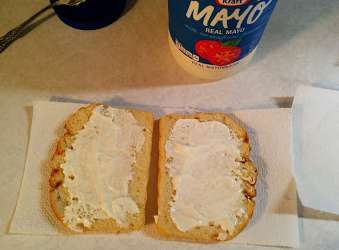 Add a generous amount of mayonnaise to one side of both pieces of bread. Wash the tuna fish package, dry it. 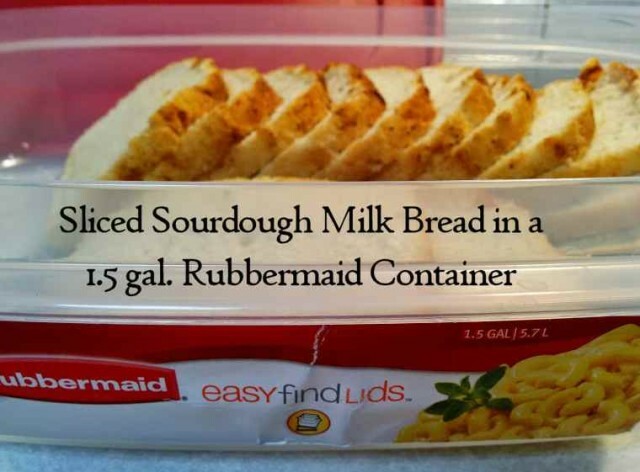 Wash the package because it might come in contact with the bread. With a pair of scissor, cut around three of the edges of the package, the top edge and the two side edges. Cut the upper side of the package only, do not cut through both sides (front and back). See image. This should make a flap, so hold open the flap exposing the tuna fish. 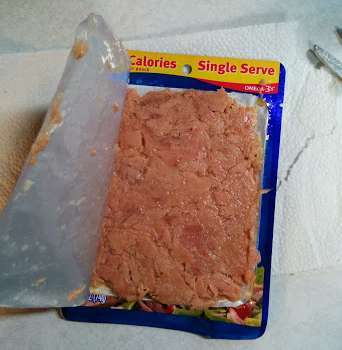 Carefully turn the tuna fish package over onto one slice of the bread. Alternatively, you can hold the slice of bread in one hand while you do step 6, but that’s not really necessary. 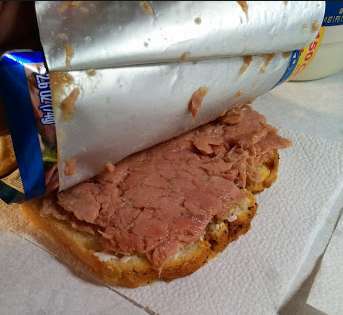 Then lift the package, making sure the tuna stays on the bread. 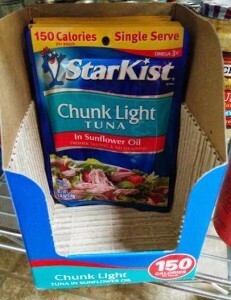 Have a spoon ready to coax off any large pieces of tuna that stick to the package. This action should cause the tuna to evenly cover the slice of bread. Top with the other slice of bread, mayonnaise side down, of course. Serve with chips or steamed potatoes, raw carrots, and a pickle.